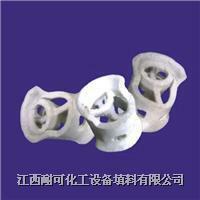 Ceramic Conjugate Ring is a kind of random packing further developed on the basis of Cascade Ring, combining advantage of both types random packing in the shape of ring and saddle. It applies the structure of conjugated curve fin and the two ends of the ring are bent outward. Moreover, the ratio of ring height to its diameter is very suitable. Due to their unique shape, both contact among conjugate rings and contact between ring and column wall are point-contact. It’s impossible to superpose each other and the accumulation void is very even, when they are stacked in the column. In a certain degree, conjugate rings also own the character of structured packing when they are stacked randomly. Therefore, the resistance to vapor-liquid is decreased and flux is increased a lot when vapor-liquid flows through the packing bed. The interface between vapor and liquid is increased so as to improve the mass transfer efficiency. It's the upgraded random packing to replace Rischig Ring and Cascade Ring. With the characters of high mechanical strength, high chemical stability, and excellent heat endurance, Conjugate Ring can resist high or low temperature, acid ( except HF ), alkali, salt and various organic solvents. It's widely applied in various packing towers of desiccation, absorption, cooling, washing, and regeneration in industries of petrochemical, chemical, metallurgy, gas and oxygen generation.